Written by noted naturalist, Dr. James C. Halfpenny. 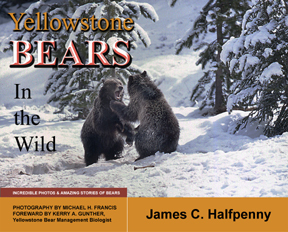 Yellowstone Bears in the Wild is a comprehensive portrait of grizzly bears and black bears in the Greater Yellowstone Ecosystem. It features new scientific research including cutting-edge discoveries about bear biology and ecology. The information is skillfully enhanced with amazing personal stories from bear biologists, park rangers, and bear watchers, and from Dr. Halfpenny’s own experiences. This hardcover edition is imprinted with the ACTUAL LIFE-SIZED FOOTPRINTS OF GRIZZLY BEAR 264, a beloved grizzly that was watched by thousands of ursophiles. Front and hind tracks are on the front and back covers. Imprints were made from plaster casts taken by Lance and Belinda Peck. Fascinating subjects include descriptions of bear sizes, bear play, curiosity, raising cubs, wolves and bears, predation and scavenging, denning and hibernation, and eating moths and worms. There are explanations of “bear art,” a bear’s “personal space,” and bear “thinking.” The book also describes how bears are responding to critical ecological changes taking place in Yellowstone. Remarkable photographs by Michael H. Francis, a renowned wildlife photographer, vividly illustrate bear behavior and biology.